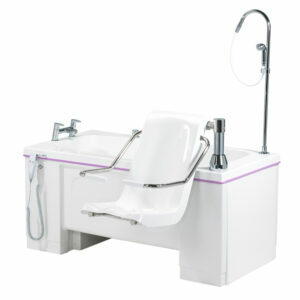 Providing complete bathing solutions, our range of assisted baths are designed with safety and ease of use for both carer and client in mind, and are suitable for installation in a variety of care environments as well as in private residences. Options are available for users with low to very high levels of dependency. Our range of assisted baths is diverse enough to suit all needs, including reclining baths with inbuilt, moulded seats and vertical, raising entrance doors, integrated hoist baths, and height-adjustable baths that can be used in conjunction with a mobile hoist. Whatever the user’s levels of mobility, dependency and size, there is a solution that makes bathing safe for both caregiver and client. The baths’ functions are controlled using control panels and handsets for ease of use. 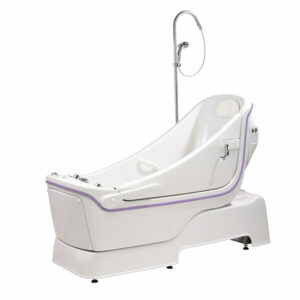 A number of features are also available that can further enhance the bathing experience for users, including hydro-massage therapy, colour therapy, and more. The entire range is manufactured in the UK, and as such can be modified to suit a range of requirements. Ergonomically designed to ensure comfort and safety during bathing and transfer, assisted are baths ideal for use in hospitals, care and nursing homes, and private residences. 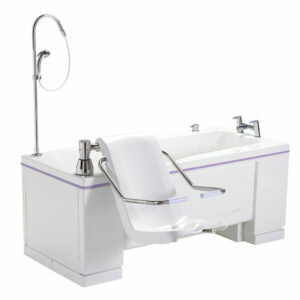 An assisted bath can greatly improve quality of life for a user, improving hygiene and overall quality of life. 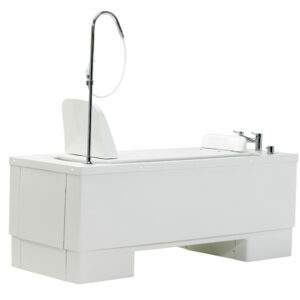 For more mobile users, baths can offer a measure of independence that is impossible with a standard bath or shower.